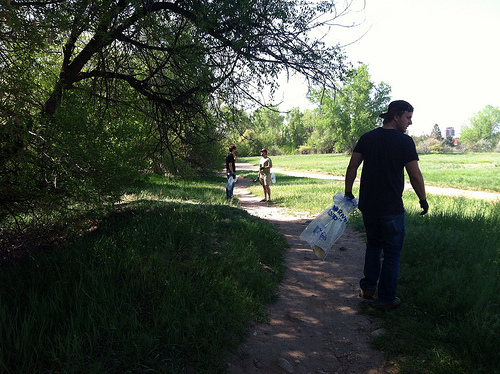 The 14th annual Cache la Poudre River Cleanup was held last Saturday and it turned out to be an awesome day helping get the river and trail in sparkling shape for the summer. Local rafting company Mountain Whitewater Descents coordinated the event with additional sponsors including Save the Poudre, City of Fort Collins Natural Areas, American Rivers and New World Sports. Its estimated that between 80-90 volunteers arrived bright and early at Lee Martinez Park armed with work gloves and a passion for keeping our local river and trail system free of trash. After a quick orientation and safety meeting reminding everyone to leave the sketchy items behind, the volunteers were given trash bags and set free to clean the river and trail between Shields and Lemay Ave. I was pleasantly surprised by the overall lack of trash along this stretch of the river. 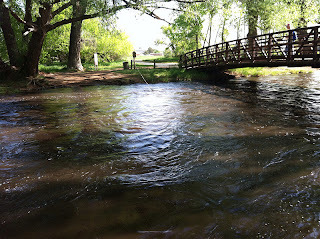 This is one of the most heavily trafficked sections of the Poudre Trail and is also one of the more scenic stretches of urban river that you can find anywhere. Although we discovered quite a mess on the north side of the river especially around College Avenue, it was still relatively clean after a long winter. I think this speaks to the incredible community of environmentally conscious citizens that we have in Fort Collins. Everyone loves the river and is willing to give it the care it deserves. On an even better note, the Poudre is running high and appears to be much cleaner and less clogged with debris after the High Park Fire last June. I highly recommend attending this event in the future as it is extremely rewarding and really brings the community together. I had the chance to speak with several anglers on the river throughout the morning and they were all incredibly appreciative of the work being done. One guy even managed to snag a large brown trout right as we were passing through the area. Following the cleanup, a large volunteer appreciation event was held at Mountain Whitewater Descents located at 1329 North Highway 287. Food was provided by the Rio Grande Mexican Restaurant and LaPorte Pizza with plenty of tasty beer courtesy of Odell’s. This was an awesome way to end the day and it was great to talk with all the volunteers about their experience. Overall, everyone seemed to have a positive experience and many indicated this is an event they will return to for years to come. 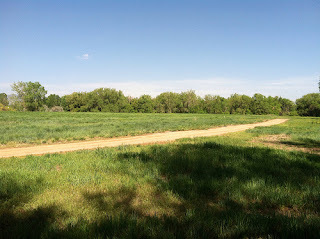 Get out on the Poudre Trail and check out the hard work done by our local volunteers, it’s pretty encouraging. "People can be divided into three groups: those who make things happen, those who watch things happen, and those who wonder what happened. Showing up is 80 % of life."